If you're in search of a way to enjoy family crafts with your kids, keep in mind that there are many fun clothespin crafts to make. There are several different reasons why clothespin crafts are a good choice for making with your children. Crafting with clothespins is frugal. Even if you don't already have some extras lying around, you can buy a large bag of clothespins fairly inexpensively. 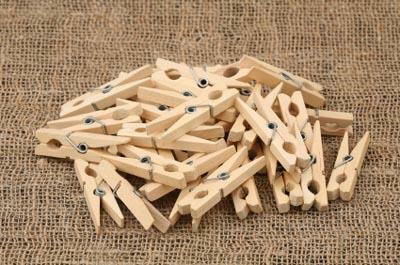 Wooden clothespins are relatively sturdy, so they can stand up to curious children. Most ideas for clothespin crafts to make are fairly simple, which is perfect for kids with short attention spans. Clothespin crafts are easy to customize, which gives kids a chance to express their creativity. Wooden clothespins can easily be turned into a clever artwork holder that proudly displays your child's creations. Or, if you're in need of a fun handmade gift idea, this holder can be decorated to display lists, notes, and other documents in the home office. Use acrylic craft paint and the foam brush to paint the stir stick in the desired color or colors. Paint the clothespins. Add stars, hearts, swirls, or other designs on the clothespins for extra interest if you'd like. Once the paint is dry, glue the clothespins onto the stir stick. They should be evenly spaced across the width of the stick. Attach the magnet strip to the back of the paint stir stick so it can be hung on a refrigerator or file cabinet. Clip papers to the clothespins for display. Pinwheels are a favorite craft for kids and a pinwheel attached to a clothespin can be clipped to any number of places. Cut a five inch square from the paper. Draw diagonal lines from corner to corner. Cut three inches down each line. Fold every other point toward center, securing with a bit of glue. Attach to clothespin with map tack. eHow describes how to make a simple version of the worry dolls children in Guatemala tell their problems to at night. Crayola has an adorable clothespin people craft project that incorporates the company's Model Magic clay. This Heart of Mine suggests using embroidery floss to fashion clothes for your dolls. Instructables has a tutorial for making clothespin dolls with clothes fashioned from fabric scraps. Making Friends has instructions for a Girl Scout, an Egyptian mummy, an angel, and a Chinese woman made from clothespins. Better Homes and Gardens suggests turning clothespins into rustic looking snowflakes for your Christmas tree. MomDot has instructions for making a cute clothespin angel ornament for your Christmas tree. All Free Crafts suggests turning a clothespin into a toy soldier. Craft Elf explains how to make a fun little clothespin reindeer. Free Kids Crafts has a tutorial for how to turn a wooden clothespin into an adorable Santa ornament.